Coprinus lilatinctus Bender & Uljé in Persoonia 15: 373. 1997. Pileus 15-30 x 8-16 mm when still closed, 20-50 mm wide when expanded, cylindrical ellipsoid or conical, expanded pileus conical to convex, finally often with upturned margin, sulcate-striate up to centre, lilac when young and fresh, then lilaceous grey-brown, the lilac tinge remaining longest at centre, later pale greyish brown or in most cases greyish, especially at centre; smooth. Lamellae, L = 36-45, l = 1-3(-5), free, white at first then grey to black with pale edge. Stipe up to 100 x 2-3 mm, slightly widened downwards, white or greyish white, at base somewhat swollen (-5 mm). Spores 9.6-13.3 x 9.0-11.2 x 6.1-8.3 µm, Q = 1.05-1.30, av. Q = 1.12-1.22, av. L = 10.7-12.3, av. B = 9.5-10.1 µm, 5-angular and heart-shaped with apical papilla, lentiform, with eccentric germ pore and convex to flattened base and rounded apex, dark red-brown to almost black. Basidia 20-45 x 9-12 µm, 4-spored, surrounded by (4-)5-8(-9) pseudoparaphyses. Pleurocystidia 30-95 x 22-38 µm, vesiculose, subcylindric, ellipsoid or subutriform. Cheilocystidia 25-70 x 12-28 µm, vesiculose, ellipsoid, obovoid or subcylindric, sometimes a few utriform. Pileipellis smooth, hymeniform, made up of spheropedunculate cells. Part of all microscopical elements, especially pileipellis, cheilocystidia and basidia with grey yellowish granules, probably consisting of oil drops. Clamp-connections present. On paths of clayey soil covered with woodchips. In small groups, more or less fasciculate. Rare, only known from Germany and the Netherlands; July-Sept.
Coprinus lilatinctus is a species rather close to C. leiocephalus P.D. Orton and C. plicatilis (Curt. : Fr.) Fr. It differs from both in shape, size and colour of the basidiocarps, size of the spores, and the grey yellowish granules in the microscopical elements, though in dried material the granules are not always clear. 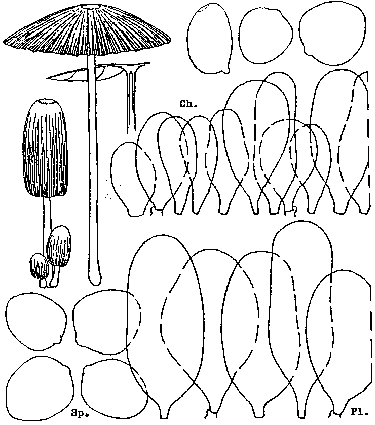 The shape of the spores is similar to that of C. leiocephalus, but they are distinctly larger (average length of spores in C. leiocephalus: 9.0-10.7; in C. lilatinctus: 11.3-11.5). In C. plicatilis the spores are more elongate and on average, just as in C. leiocephalus, less than 9.5(9.8) um wide (in C. lilatinctus 9.5-10.1). 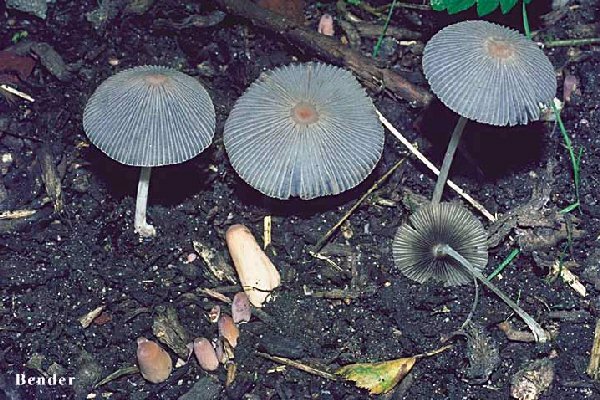 Coprinus nudiceps P.D. Orton agrees in spore size, but that species is smaller, lacks lilaceous tints and never grows on wood-chips. However, the most important difference is the shape of the spores which is rounded triangular in C. nudiceps and without the lemon-shaped apex that is characteristic in C. lilatinctus, C. leiocephalus and C. plicatilis.